• The space rock struck Earth’s atmosphere with a force of about 300 kilotons, or 25 times greater than the atomic bomb dropped on Hiroshima in 1945. • The 55 foot-wide meteor was comprised mostly of iron, weighed about 10,000 tons, and was travelling 40,000 mph when it exploded, according to NASA. • The shock wave shattered 50 acres of glass in the windows of more than 4,000 buildings in Russia’s Chelyabinsk region during a frigid winter. Nearly 60 per cent of the windows have reportedly been replaced. • “The impact wave and blast damaged around 297 homes, 12 schools, a number of other social facilities, and some industrial sites,” according to Russian Minister of Civil Defence Vladimir Puchkov. • About 1,200 people were injured — largely by flying glass — and 40 were still hospitalized as of Sunday. • More than 24,000 workers and volunteers — with “3,000 pieces of equipment and 8 aircraft at their disposal” — mobilized to the region to cover windows, gather food and make other relief efforts in the face of an estimated $33 million in damages. • The meteor reportedly left a 20-foot-wide hole in Chebarkul Lake (about 50 miles outside the city), and Russian scientists say they’ve found fragments of it. 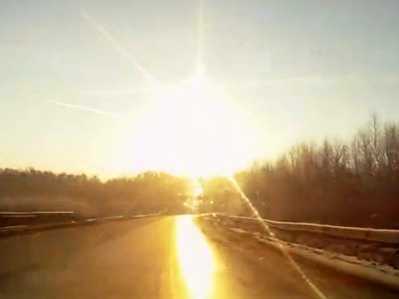 The aftermath of the extraterrestrial rock has attracted “meteor hunters” looking to cash in on the “once in a lifetime event.” NASA said the meteor was the largest reported fireball since the Tunguska event in 1908.